The Lumineers are a folk rock band, based in Denver, Colorado. 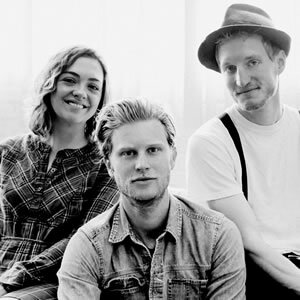 The two founding members and songwriters of the Lumineers are Wesley Schultz (lead vocals, guitar) and Jeremiah Fraites (drums, percussion). Schultz and Fraites began writing and performing together in New Jersey in 2005. Neyla Pekarek (cello, vocals) joined the band in 2010. Stelth Ulvang (piano), and Ben Wahamaki (bass), joined the band as full-time members in 2012. Their self-titled debut album was released on Dualtone Records on April 3, 2012, eventually peaking at number 2 on the Billboard 200 chart in January 2013. As of December 2012, their debut album has been certified gold in the US, UK, Australia, Canada and platinum in Ireland. On June 14, 2012, the album's first single "Ho Hey" debuted at number 90 on the Billboard Hot 100 chart, their first song to do so. "Ho Hey" later peaked at number 3 on the Hot 100, making it the band's first Top 5 single, and as of December 2012, the single had sold over 2 million copies, making it their first Double Platinum single. By June 23, "Ho Hey" hit No.1 at commercial Triple A radio, where it spent 8 weeks, and on September 17 the song hit #1 on the Alternative Radio chart where it stayed for two weeks. "Ho Hey" reached #1 on the US Hot AC airplay chart in December 2012, and #2 on the US Top 40 airplay chart, which makes it the highest charting independent label single in the history of the charts. "Ho Hey" is also having huge success internationally, reaching #1 on the Canadian Alternative radio chart and #17 on the Canadian single sales chart. It also reached number 8 in the United Kingdom, becoming their first Top 10 single there.